Otay, once again that 'Ol Johnny Cash "I've Been Everywhere Man!" song is playin' in my head, having just been on another chaotic Roadtrip - while another year's Spectale du Jour, thy Indianapolis 500 has done gone by, and I hate to admit it, but; I've totally lost my enthusiasm over the Indy 500 during this year's event, thanks largely to the disgustingly OVER-COMMERCIALIZATION instituted by Hulman & Co in partnership with ABC; oh wait a 'My-nute, that's right, I forgot 'bout A-L-L of that "Extensive live Wall-to-Wall qualifying coverage; BARF! As why does the words Temporal Scan Lobotomy 500 enter thy mind after listening to the race upon 1070 The Fan, since I couldn't figure out where the FLIPPIN' "live timing & scoring" link was upon the Tokyo Fly-by-Night Indycar.com website; but I digress! Originally wasn't planning upon watching any of ABC's "Extended Coverage" of I500 qualifying, but after having been in a van with thy "FURR-Rocious lap Hoonds" Molly 'N Pixie for 2-days, having listened to non-stop freight trains oozing coal dust alongside the Columbia River while Big 'Ol Herkin' Jetliners rumbled overhead, not to mention the helicopters, small engine Aeroplanes and whatever else was plying its way upon the mighty Columbia, I pronounced to Tacoma Bureau Chief Mary Ellen that I'd like to check out Saturday's riveting "New & Improved" Qualie' show live from Mother Speedway upon our return. Yet Alex from Oh 'KanaDuh, nope, NOT Alex Lifeson but I digress further... Announced that he wished to go to the dock instead, as I witnessed 'bout three or four qualifying runs, most noticeably being disappointed over Justin 'B-I-G UNIT Wilson's inability to crack the Top-9 with a P14 run to that point during Saturday's riveting Qualie' coverage - before we left for the pleasant sunny climes "O Tacoma's Dash Point waterfront, specifically the dock that had originally been first erected in 1907. Imagine a time when there weren't' any automobiles, which in many parts of the Pacific Northwest was exactly the case in the early 1900's, when instead a various collection of Steam Ships known as the Mosquito Fleet ferried people about the various isolated areas of Washington plus Vancouver, BC, Victoria and all points in-between. Thus, as noted, the very first dock enabling passengers and supplies to disembark at Dash Point in Tacoma, Washington was constructed in 1907, although it's all wood construction deteriorated quickly from the Northwest's environments harshness, needing to be reconstructed shortly afterwards, with the following metal dock enduring for some 78yrs before its replacement, as I think Mary Ellen read to me that they're currently upon Dock Number Four? As mentioned, the Puget Sound's Mosquito Fleet, which began plying the Warshintonian' waters in the early 1850's, with service thru World War II consisted of competing enterprises in all sorts of nautical motivation where the fastest ship usually won the route's passenger traffic, typically supplemented by mail delivery stipends and freight delivery. Having skipped the majority of Saturday's Qualie' show in order to enjoy a dry, sunny day outside; having noted that it really didn't matter until Sunday when the Fast-Nine Shootout occurred for the Pole position, Mary Ellen turned thee Telie' on for Mwah just prior to 10AM Pacific (Sunday morning) in order to watch the B-I-G show. Yet unbeknownst to Mwah was the fact that the first hour-pluses? Airing would be nothing more than filler as Mary Ellen kept asking, when's the qualifying gonna start? Hence after 42mins of BLATHER! We elected to go outside with thy young Alex announcing once again how he wished to go to the dock to which I totally concurred with, as hey! Any day on a beach is far better than sitting inside waiting 'N waiting for qualifying to begin; Crikeys Mates! Hence, not having watched any of the Top-9 Shootout, I fail to understand how the program got a 1.2-rating, which is higher than ANY race this year prior to the Indy 500. 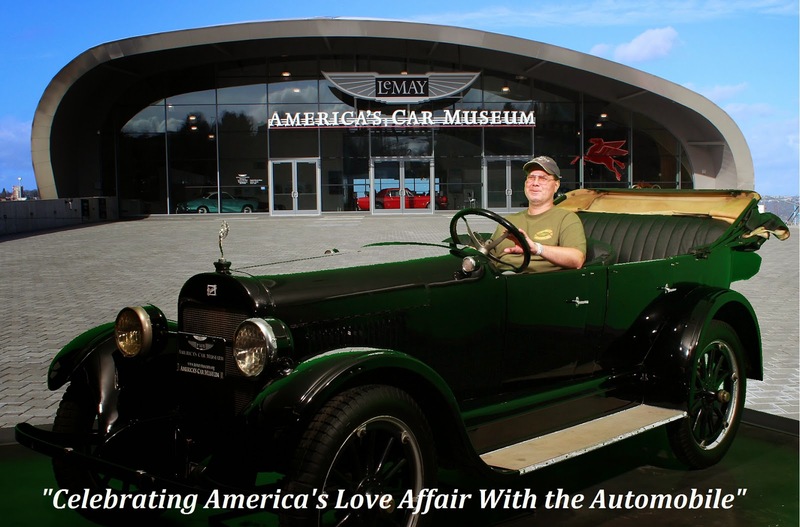 Thus, before making another eclectic "Three Hour Cruise;" Err Bus trip homewards to my frumpy 'lil abode, I was delightfully surrounded in the soothing confines of the LeMay America's Car Museum (ACM) of which funnily enough? The nice lady at the admissions counter said I recognize you; WTF? to which Mary Ellen said later, how many 94-year old's in a wheelchair escorted by a blind person come to the museum? Nice, as the very first thingy we ran into on the top-floor was a very eclectic smattering of VW's on display behind the main entrance hall, including a white Beatle racecar w/#53 on it, while there was an example of one of the longest running racing series with its ubiquitous powerplant bolted into the backside of the requisite single seater racing car, a la a vintage Formula Vee, as it was VW's successful way to promote its brand with its air cooled four cylinder 'lumps. A fine example of a Karmann Super Beatle convertible was parked nearby, albeit a 1979 model me thinks? 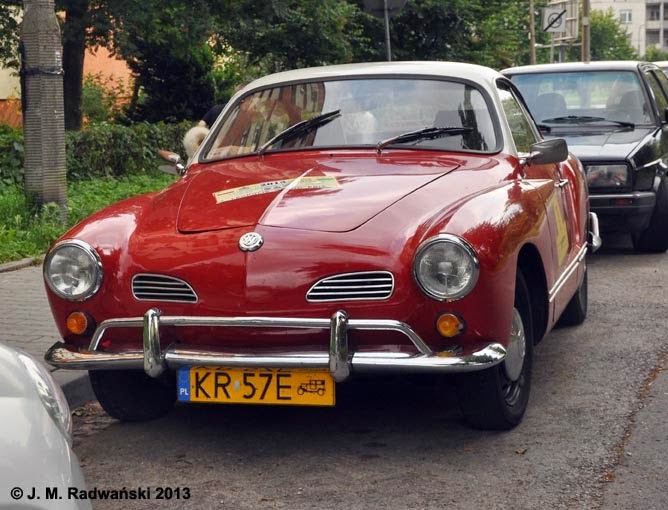 Thus not sure if there was any association with Karmann on Super Beatle's or not? An iconic Karmann Ghia coupe sat alongside the Super Beatle, as I was unaware that said vehicle was the result of Volkswagen executives wishes for a "Halo car," with Karmann being a German manufacturer while Ghia was the very same Italian styling studio that's created various Supercars over the decades. My "Posse" were most intrigued by the VW double camper van, which I think had a canvas roof adorning its rear section? While a ubiquitous Thing was also on display. Winding our way down the building's side ramps, we stumbled upon a very strange white "luxury" car, as I became more intrigued over its mystery origins, i.e. ; believed it was called an Abbadah? Which I tried burning into thy memory banks for the day's long haul home - having once again gone unprepared without any pen 'N paper for note taking. Yet upon scouring of Zed Internetz, I'm pretty sure it was actually an 'Uber rare Abadal, which were the inspirations of Francisco Abadal, a Spanish racing driver who branched out into automobile production along with becoming a GM Agent afterwards, since as typical, there seems to be no information upon the man himself, as I ponder what he raced, etc. Then we ran into the first of two or three? Vintage racing cars, with the first peaking my curiosity due to the name of its body's inspiration, a name I knew from my previous Brickyard Loti studies, specifically that being the Kuzma-Lotus Ford of Parnelli Jones in 1965. As it was a Sid Car Super-modified 1949 Sprint Car with Eddie Kuzma body. Then next up was a very clean Lotus Type-35 F2 racecar with the #35 clearly visible to Mwah in its number "Meatball's." As I reveled to myself how refreshing it was to see just the clean unencumbered lines of bodywork devoid of today's obligatory sponsorship 'Deckle's, (decals) which have become so pervasive in our modern society! Having quickly passed by the George Barris Flintstone's mobile we'd made our way down to the museum's bottom floor and its Alternative Technology section - where our friend's 1903 Baker Electric was still on display, as we gradually began our long ascent upwards, passing by first a new-to-me Baldwin steam-mobile, before walking past the often seen Stanley Steamer before encountering a new trio of "automobiles." The first two were pretty futuristic looking, both being powered by nature racers, as the local nearly "North-of-the-Border" Bellingham, WA's Western Washington University's (WWU) solar powered car sat alongside Michigan University's Austin, Texas to Calgary, Alberta solar challenge winning racecar entry. Next up was a not-so-stock looking Jetta turbo hybrid LSR vehicle. As I say not-so-stock looking since it seemed to have been stretched along with being faired for terminal velocity, as I was unaware that VW had set a production class Land Speed Record with its Jetta, having broken the once unobtainable mythical 300kph barrier, which said Jetta did so in 2012. Climbing further up the building's side ramps we worked our way thru the British section, while some where's in the museum Mary Ellen asked me if I knew anything about Crossley's? To which I really don't, other than I thought perhaps it was British and a competitor to MG? Then "My Posse" spotted another oddity, which I believe was a "One-off" Olympic Trucks(?) vehicle, symbiotically making full circle as the lone remaining model originally produced in Tacoma, Washington was rightly residing in the LeMay ACM in Yuhs guessed I-T!